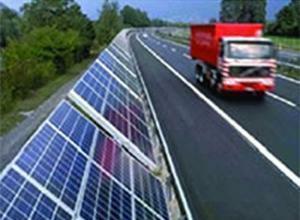 The integration project of the expressway and solar power can is free of electric charge and maintenance costs. It can improve the appearance of the city, reduce financial pressure on the government, and provide you with great economic benefit. The solar roof tile protects the station from lightning through the component supports connecting the ground and the control cabinet containing lightning protection modules. It combines an inverter, power distribution and lightning protection together, reduces line links and improves system stability. 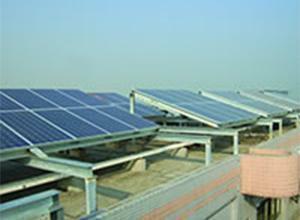 The clean solar power successfully satisfies station' demands for power supply. 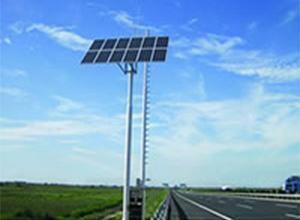 The solar lights feature energy conservation, environment protection and bright lighting. They automatically generate electricity by their solar panels all day long. With high adaptability and practicability, they leave out complicated and costly cable laying, allow any adjustment of layout, and become the landscape of the highway. 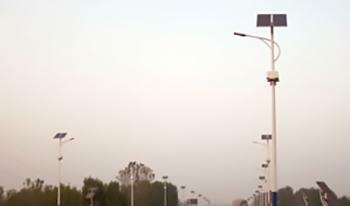 The lighting and energy-saving facilities in the highway service station comprise solar power products, which generate electricity, landscape the surroundings and light the ways. These practical products successfully reflect cultural value and protect natural environment. This system belongs to an off grid solar power system. In the daytime, when the illumination intensity meets the condition of power generation, its photovoltaic modules start to charge the storage battery through a controller. Then electric energy will be transmitted to every device of the monitoring system through an inverter that is installed at the output end of the controller. 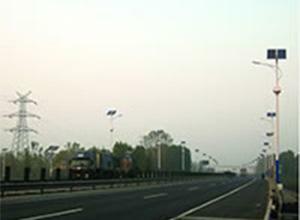 If the illumination intensity is too low, the system will be powered by its storage battery which is able to meet the needs for working in continuous rainy days. The solar photovoltaic sound insulation system consists of acoustic panels that are composed of solar modules and acoustic insulating materials. It can effectively block out noise, adequately make use of the renewable energy source, generate electricity, illuminate the roads, protect environment and save energy. 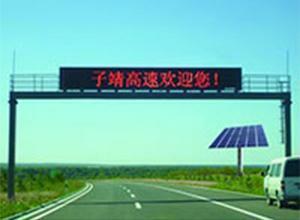 The board is powered by solar panels and timely post messages on related regulations, knowledge and information. 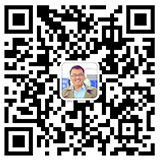 It is praised for high brightness, good composability, easy operation, great efficiency, low consumption, etc.